Last week I posted a short tutorial on using grids in Photoshop to create a quick dungeon map. The last panel of that tutorial showed a dungeon map with some layer effects added to give it a little pop. Today I’m going through the layer effects I used to show how it’s done. A note of caution on layer modes – they can easily be overused. If you turn them all the way up to 11 then they’ll scream their presence to anyone looking at your map. Bang them in at full opacity, then dial them down to create a more integrated effect. 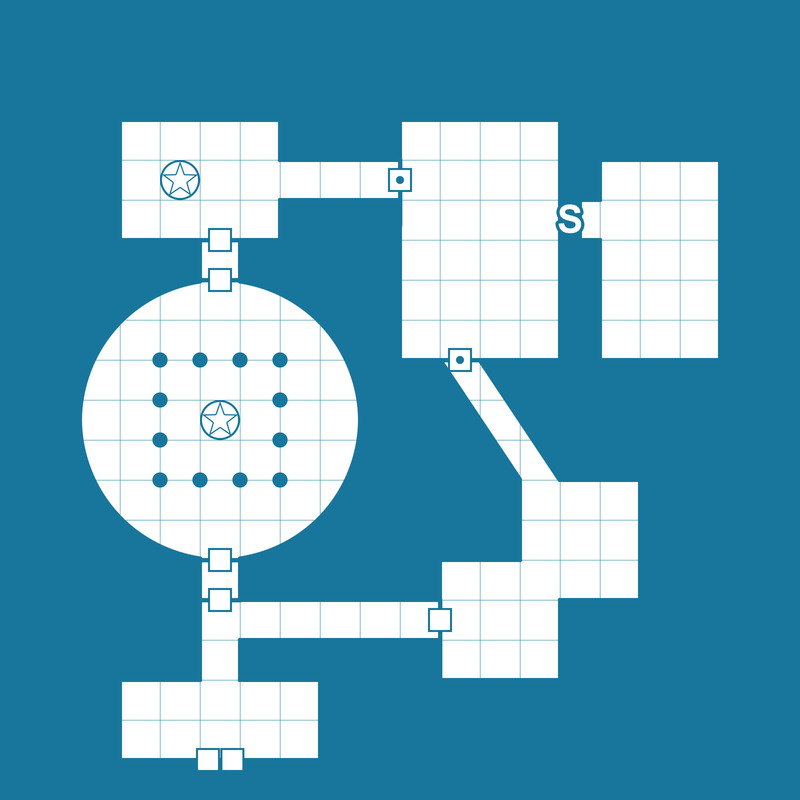 After last week’s tutorial you should have a nice floorplan for your dungeon map. First find a nice neutral background with some slight textural variation to it. Paper and stone textures are good for this (try http://cgtextures.com). I’ve placed the floorplan on a new layer and changed it’s colour to light blue ( #868ba6 for those that want to reproduce this in Photoshop or Gimp). You can change the colour of a floorplan by locking the transparency of the layer (first of the four Lock options at the top of the Layers panel) and then fill with a colour (Edit->Fill, or option/Alt + delete to fill wth the foreground colour. Finally I’ve set the blend mode of the layer to colour burn. Notice how the texture of the layer behind is clearly visible? The colour and tone difference separate the walls cleanly from the background, but the texture keeps the whole thing unified. Here I’ve added a 2px stroke in black at 100% opacity to clearly delineate the walls (they are important after all). I’ve also added a black outer glow with a blend mode of overlay and an opacity of 75%. Notice how the walls now separate from the floors and you get a sense of depth. The shadows aren’t quite deep enough. Rather than bump up the outer glow I add a drop shadow with no offset (offset drop shadows imply directional light, and I don’t want that impression inside a dungeon – light sources should be in the rooms, not outside shining across the map). The drop shadow here is dark brown and has a blend mode of color burn with 75% opacity. That gives some great over saturated shadows and really dark nooks and crannies. Finally I’ve added an inner glow. This highlights the edges of the wall, and contrasts with the dark shadows. I’ve used an inner glow in white with a blend mode of overlay, 40% opacity and a size of 50px (half a square). I this case I’ve avoided using any Normal, multiply or screen blend modes (other than for the stroke). These modes mask the underlying texture, whereas the overlay and colour burn blend modes combine with it. I want the texture to unify the layout and provide some visual variation throughout the map. Play around with the different options. Inner glow, outer glow, drop shadow and inner shadow give you lots of options for creating edge effects around an area. Once you’ve found something you like, click the New Style… button in the layer effects palette and give it a name. Now you can apply this layer style to any future selection by going to the Styles item on the left hand list and finding it again. These skills don’t just work for dungeon layouts, but also for text effects, logo design and much more. It’s really worth the time to dig in and get to know the layer effects panel. For Gimp users, there aren’t any layer modes (well, not out of the box. There’s a plugin that replicates them and you can find details on installing it here). However if you have a floorplan you have a selection. This selection then allows you to use filters such as drop shadow, which mean you can replicate all the effects here very easily by a combination of layers. You can also use Stroke Selection to create the stroke in step 2. Mask out the side of the stroke you don’t want to use (using your original selection). It’s pretty easy, and can also be used for coastal highlights on world maps, regular parallel lines to create a railway or surround an area with buildings. It all depends on the brush you stroke the path with. (click the image to download the full sized image, or right-click -> Open Image in New Tab to see it full size whilst you read along). Start with a textured base and draw your walls on a separate layer. Make sure your floor area is entirely enclosed by walls or the edge of the canvas. This creates a work path. Drag and drop the work path to the New Path button to create a permanent path. You also want to invert the selection and do the same process to get a path that surrounds the floor space. You’ll now have two paths. Now a quick tweak – I desaturate the background layer using an adjustment layer. I also add an overlay layer that’s masked to just hit the walls. Create a group (folder icon) and mask the folder so that the floor is masked out and the walls are open. In the group create a new layer. Now select the path that surrounds the floor. You don’t want to have a selection going round the outside of the walls, because we’re going to stroke the path and we don’t want the outside of the canvas to be highlighted. With the path selected go back to the layers palette and make sure the new layer is selected. Pick a nice large brush and press enter. First off, I want to put in a grungy highlight along the edge. I use a large grungy brush with a low opacity (around 10%) Start off really big – like 100-200px – and stroke the path with white (hit enter with the layer selected – you should see a brush stroke around the path). Then reduce the brush size and do it again. Rinse and repeat until you have a nice gradual highlight up to the wall edge. I set the layer to overlay to get a nice textured highlight. This is nice, but it needs to have an extra texture. I set up an extra layer and this time I’ll use a hard round brush with lots of scatter (1000%), colour jitter to swap light and dark and a low opacity (around 20-30%). Stroke the path again (make sure the path is selected then hit enter with the brush tool selected) with a few different sizes of this brush. You should have something like panel 6. Now set this layer to overlay and set the opacity of the overlay layer to have it blend in. In panel 8 I have this layer set to multiply at 100%. It’s a little overbearing, so I reduce the opacity to 10-20% and create a new layer, this time set to overlay. Repeat the process of stroking the path and you should get something like the final image. Here’s the original psd if you want to look at the full breakdown of how this was created. Note that this process is the same amount of work for 1 room as 100, so it’s great for adding texture to a large map – and it still looks hand drawn rather than too photoshopped. In honour of the news that Wizards will be reprinting the 1Ed core rulebooks I thought I’d go old school and put together a quick old school map. The walls were placed using the tips on grids from earlier this week. The colour is key to getting that old school feel – it’s #18769d. To add the grid, open this file in Photoshop and go to Edit->Define Pattern. Now you can flood fill a region with a grid by going to Edit->Fill… and choosing Pattern -> 100px grid. Lock the transparency and fill with blue to get the old school blue grid. The statues are just a circular graphic (provided below). The Gimp version of this tute can be found here. Following the quick tutorial on old school D&D maps, Scott Pelegrino asked whether it was possible to set the Fog of War in maptool to be old school blue so that as players explore, they reveal the white floors from the blue unknown. The answer is yes! Once you’ve imported your map into maptool – go to Map->Edit Map and choose the Fog tab and set the colour using the HSB settings to the values shown in the image above. Now the Fog of War is classic old school blue! You can also set the grid colour in the same way. The tokens in these screenshots are not mine, but come from the free token packs by Devin Night. Check them out, they’re amazing. As with previous tips, these first appeared on my Fantastic Maps Google+ page, and on facebook. Really enjoying these even though I am almost Photoshop and Gimp illiterate. Thanks! Thanks! Let me know if you get stuck, or need a hand with any of them – I’ll happily expand on the bits that might be glossed over a little quickly. There was a tutorial (by RobA, I think) at CG regarding TSR-style old school maps, including simulating the ink bleed on the lines (which is a nice touch, after a fashion). I can probably dig it up if you’re interested. A link to that would be handy – and keeps all the info in one place. Thanks! Good call. I haven’t experimented with custom PS actions, but this is a great example of when it helps out. Oh, I’m a big fan of the automation features of Photoshop. If you ever need help automating something, I’m your man. The less time I spend doing repetitive tasks, the more time I have to be creative. Thank you for this great tutorial. I’ve repeated the first part and it works. I have one question though: how do you do the dungeon floor tiles which we can see in your Weekly Tips 2 grids2.jpg picture? Is there a way to do them quickly with Photoshop with a nice random look, or is it just another layer with a texture hand-drawn or taken from CG textures? And another less important question: what are your favourite textures from CG textures? could you provide some links please? Thanks! The trick to adding flagstones in photoshop is to create a flagstone texture for the lines, and another for the light and shade. If the two textures are different sizes (different numbers of squares to a side) then when you tile them, they won’t repeat together and you get a nice semi random patterning. If you layer a number of textures this way then you can get patterns that hardly ever repeat at all! My favourite CG textures usually come from the paper, stone and metal sections. I find that tiling textures are the most helpful, and textures with a similar tone across the whole texture. I don’t have any to hand right now, but they’re very easy to find whilst browsing through those sections, and the joy of doing it that way is that you stumble across gems you might not otherwise find! Stumbled across your blog while making a map for download. I’m old school, and symbolize doors by using rectangles, like 1st ed. I tried to figure out what was more common and recognizable. Still not sure. Any suggestion? Rectangles vs. the curved line? For old school maps I’d go with the white square. It’s clear and you can add a dot to make it obvious it’s a locked door. I don’t know too many old school hack games that need to know which way the doors open, so I don’t see the need to put in a swinging door symbol. I’m interested to see how your scanned graph paper experiment works out! There are lots of graph paper sites that will allow you to download a clean grid for use in programs like Photoscape if you need them. Or, if you’re using a program like the Gimp, it’s often very easy to create a grid in the program itself. thanks for this, great tutorial. It was very hard for me to know what layers you were using and what effects you were applying to what. It’d be nice to see this broken down step by step with screen shots, but otherwise it gives some good insight. Quick question on the layer effects piece. How did you get the interior wall color/texture? I am guessing that the final appearance depends largely on the underlying layer’s color and texture, or am I wrong? Thanks again for these extraordinary guides! In the layer effects piece, the colour is a combination of the background colour and texture, and the wall colour burn layer. Colour brun is a transparent blend mode, so you see the texture come through from the paper. The layer itself adjusts the colour of the underlying piece (and darkens it). You should play around with different colours on the colour burn layer and see what effects work well. 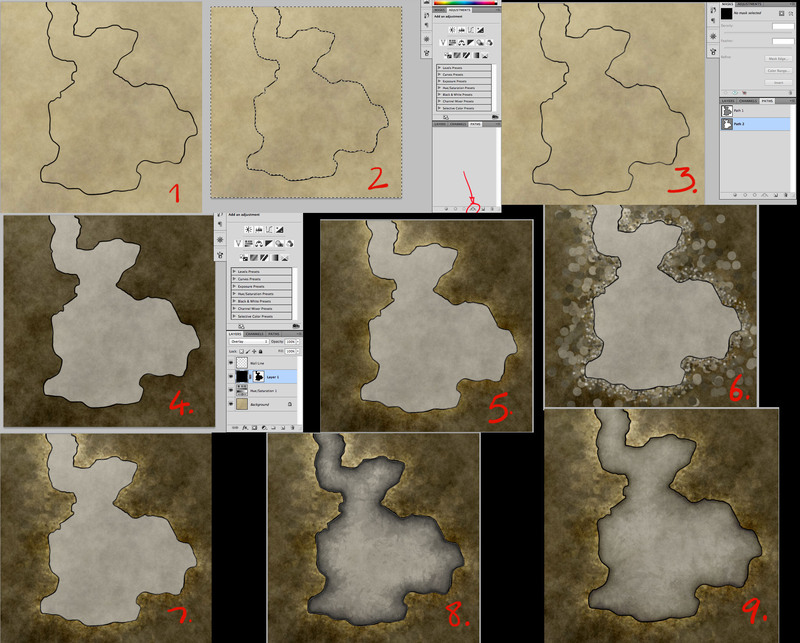 How do you go from yellowish to dark brown in Step 4 of the wall textures? I’m a bit of a photoshop noob, and so my questions are going to be quite a bit more basic than everyone else that’s commented so far. 5. Create a group (folder icon) and mask the folder so that the floor is masked out and the walls are open. Do you mean just go into the paths pallette and highlight it? Again, I tried this and it didn’t seem to make any difference when I used the brush tool. I know that those with a better knowledge of PS would have grasped this tutorial straight away… Sorry what I probably need is the “dummies” version of your tutorial… or a video perhaps. 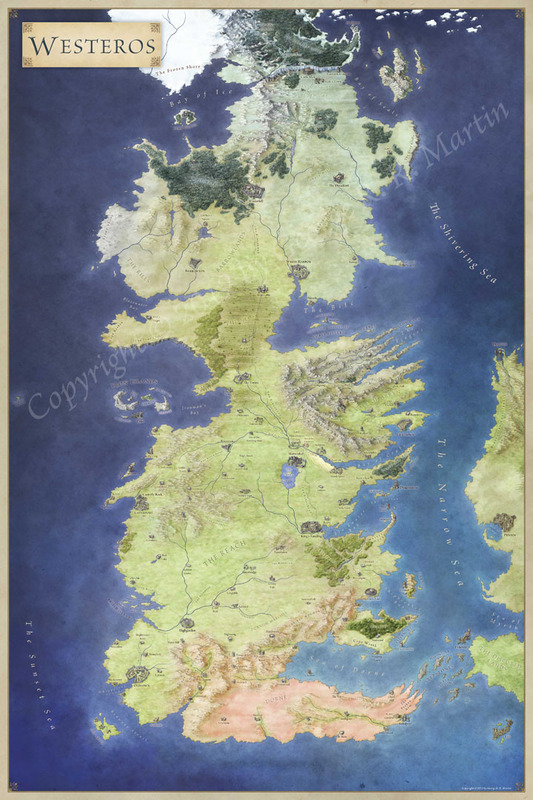 But I do love the look of your maps, and am determined to grasp this tutorial. I’ll just keep going over it until the “aha” moment arrives!